Barry Miller ... Bobby C.
Paul Pape ... Double J.
Martin Shakar ... Frank Jr.
Pizza Girl: Hi ya, Tony. Two or three? Tony Manero: Two. Two. Give me two. That's good. Courtesy of Delite Records and Delightful Music Inc.
Q: Why did Annette show Tony a handful of condoms? Q: What are the differences between the PG Version and the Uncensored R-Rated Version? Q: What was the deal with the guy in Stephanie's apartment? "Would you just watch the hair? I work a long time on my hair, and you hit it!" - Tony Manero. 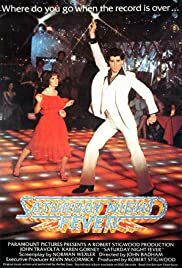 "Saturday Night Live's" theme tune, "Staying Alive" (the title of the horrendous Sylvester Stallone-directed sequel), speaks as much truth about life as the film itself. "I'm goin' nowhere, somebody help me, I'm goin' nowhere, somebody help me yeah" chants a voice in the Bee Gee's universally known disco hit. As I listen to it right now, I realize just how perfect it is for the movie. It's a legendary song, and for good reason. 98 of 116 people found this review helpful. Was this review helpful to you?